Human being have the innate desire to improve themselves. 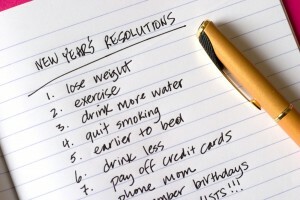 As we come to the end of January, many people are starting to wane in their vigor for the New Year’s resolutions they may have made just weeks ago. Some of us may feel like we’ve lost the battle of the bulge, given up on a dream or maybe psyched ourselves out on achieving a worthwhile career goal. Just because you haven’t succeeded NOW doesn’t mean you won’t in the FUTURE. It’s hard to maintain a positive outlook on life when there are so many negative influences around us. “You can’t” is heard more often than “you can”; “you won’t” more so than “you will.” We are constantly surrounded by people who want to keep us down because they need to feel good about themselves. More than likely, they do so because they are frustrated in their own inability to achieve the goals or resolutions they set out to accomplish. Despite the negativity around you, don’t give up on your resolutions, because they were made with the best intentions at heart — namely the desire to be a better YOU. Remember the words of Denis Waitley, “Determination gives you the resolve to keep going in spite of the roadblocks that lay before you.” Realize, there will be challenges to overcome in your campaign to achieve your goal. Exercising after a long hiatus might be difficult at first. Learning a new language might be severely frustrating if you don’t see immediate progress. And it is often impossible to maintain an optimistic spirit if the doors of opportunity keep shutting in your face. Pastor and motivational speaker Joel Osteen once said, “When a door closes in front of you, it is God saying ‘That’s not the right place for you.’ Trust in God to guide you in the right direction and he will bless you with an abundance.” It might not seem so at the moment, but the resistance experienced on the way to achieving your resolution is a good thing. In the world of bodybuilding, athletes use resistance training to build stronger muscles — the harder the resistance, the more powerful the muscles can become over time. In the case of your resolution, the resistance is making you stronger for your journey, building up your forward momentum so you can make it to the finish line and experience the overwhelming joys of success. Until then, there are two very powerful techniques you can use to maintain your resolve — and they both come in the form of questions. The second question expands upon the need for action by asking, “What can I do on a regular basis that will bring me closer to achieving my resolution?” If you want to lose weight, you could schedule a set time during the day that will be devoted solely to exercising. No matter what happens during the day, shortly before that appointed time, you would stop what you are doing and prepare yourself for your exercise session. The time for activity could be as short as 15 minutes or longer depending on your daily routine. But, what gets you closer to your achieving your goal is the hyper-focus on not missing that appointment. After time, the session will become second nature and before you know it, you will have reached and most likely surpassed your pre-conceived fitness goal. These two questions will force you to regularly check-up on your progress — and will help keep you focused on the goals you want to reach and not the obstacles that present themselves along the way. To many, serious resolutions seem lofty and unobtainable — that is why people marry their desire to accomplish them with a monumental event like the coming of a new year. But after the novelty of the moment wears off, familiar habits re-emerge and resolutions often sulk away. If you truly want to accomplish your goal, remain resolute and unwavering. Make obtainable benchmarks and then ACT with determination in accordance with your plans. Don’t give up because any positive resolution made is done with a pure and honest spirit, and the universe rewards those with a genuine desire for personal growth. It is as Edward Gibbon said, “A heart to resolve, a head to contrive, and a hand to execute.” So, resolve, contrive and execute! And in no time, you will ACCOMPLISH and ACHIEVE!